The excitement over Christmas has completely died down. We have taken down the Christmas decorations and the house is back to normal. It usually feels a bit gloomy at this time. It takes getting used to not having as much flickering lights. As I look back to the holidays, I feel a tinge of guilt on eating the food I have just done. I usually am able to restrain myself but faced with a big celebration, I just go all out. I still have the remnants of Christmas in my kitchen which I now want to incorporate into our meals, albeit with more restraint. 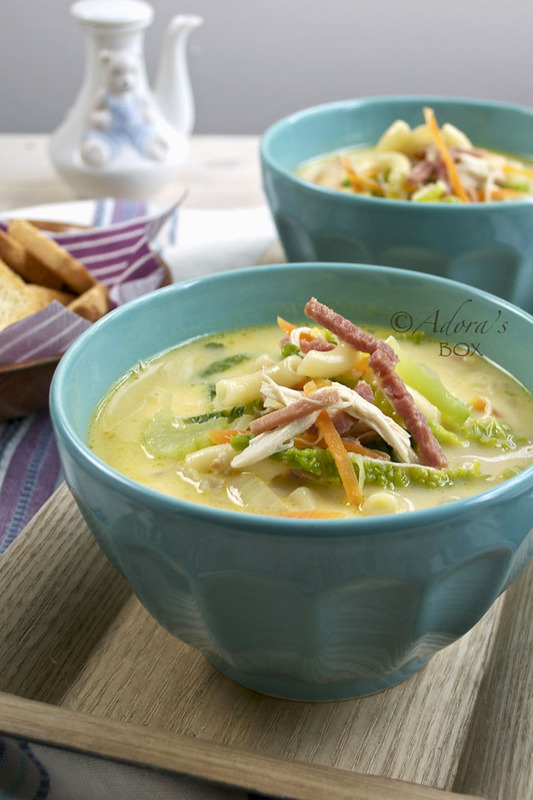 Chicken macaroni soup or sopas (simply meaning soup) as we call it is the usual way of reusing bits of cooked meat and stock. 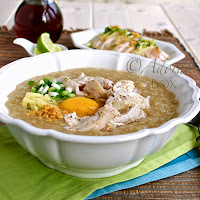 This is probably the Filipino equivalent of chicken noodle soup. The difference is that it has milk in it and it is runny rather than thick. If you have odd bits of turkey or roast chicken and ham, now is the time to bring them out. Stock made with the turkey bones is good for this also. It is not exactly what you might call temple food but it isn't highly calorific either. I used a small amount of butter here, semi-skimmed milk rather than evaporated full fat milk and a smidgen of cheese which you may omit if you prefer. If you have leftover hard rinds (not the wax, no!) of edam or parmesan, throw it in with the stock. It won't melt but it will impart a rich cheesy taste to your soup. This recipe is just a guide. Feel free to alter the amounts and the mix of ingredients. I don't put a lot of pasta in my sopas because that dilutes the taste of the dish but make it chunkier with vegetables. Served with croutons or biscocho (crisp bread), it is filling enough for lunch. 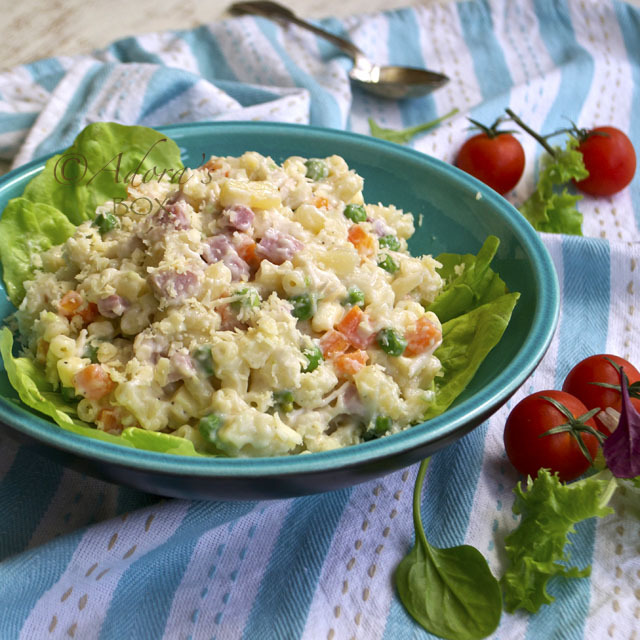 It is a comforting and satisfying bowl of goodness, a delicious legacy of the Christmas past. In a pot, sauté the garlic in the butter on gentle heat until fragrant, about 2 minutes. This does not need to colour. Add the onions and salt and cook until translucent. Add the chicken stock and bring to a boil. Add the shredded carrots, dry macaroni and ham. Simmer until the macaroni is half done, about 5 minutes (depending on the size of the pasta that you use). Add the chicken, cabbage and milk. Bring to a boil and simmer until the cabbage is crisp tender, about 2 minutes. Do not overcook. All the ingredients will cook further as it sits. Lastly, add the cheese and pepper. Stir and and season to taste with fish sauce. Take off the heat. Serve hot with biscocho or croutons. 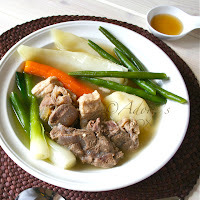 This looks so fulfilling to have during rainy season...yes, it is raining here almost everyday and having with some soup is just the right thing to warm up. 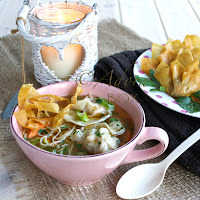 I loves this soup, really and with all those right ingredients for me. The temperature suddenly dipped today and bitterly cold weather over the next few days has been predicted. 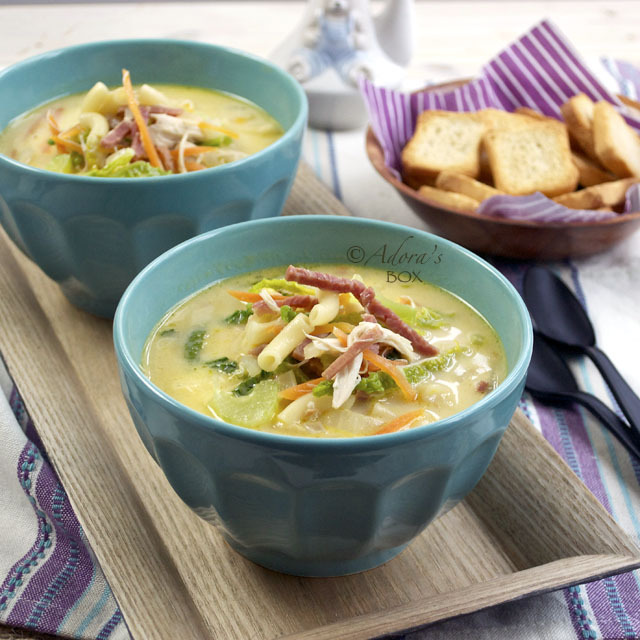 A big pot of sopas swill come in handy. Stay dry, Mel. ... but, Chinese New Year is coming.... haha.. I have to really watch my diet.. Exactly, Chef. One month to go and all my resolve to eat healthy will go out the window. Happy New Year Adora! It's been very cold here and I'm attracted to soup and stew dish all day. This sounds very comforting and nice, and I love your blue bowls... as always very beautiful presentation! I thought all recipes were a guide. 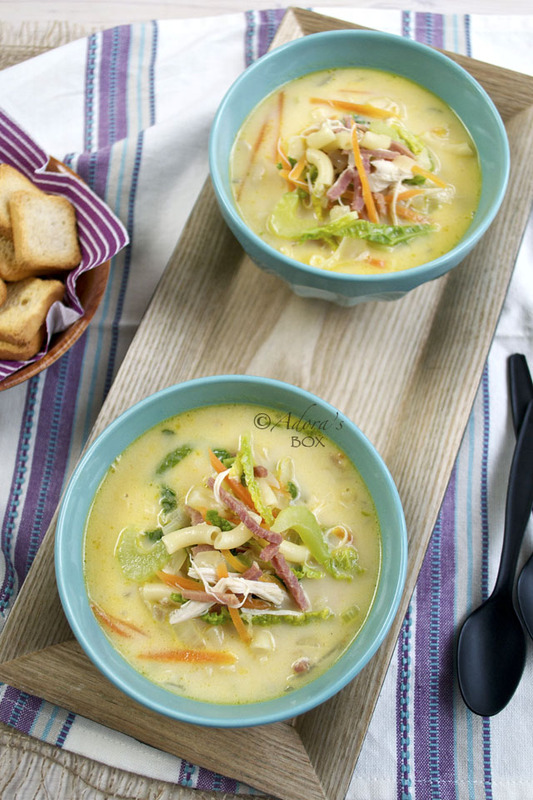 :) Actually, this chicken soup recipes looks perfect - simple, hearty, basic ingredients. It would be hard to change it. Perfect soup for the cold weather we're having today. Funny Mj. Some are mere suggestions and some are exact formulas (those I fear). The cold weather seems to be widespread. Anyone feeling the heat?